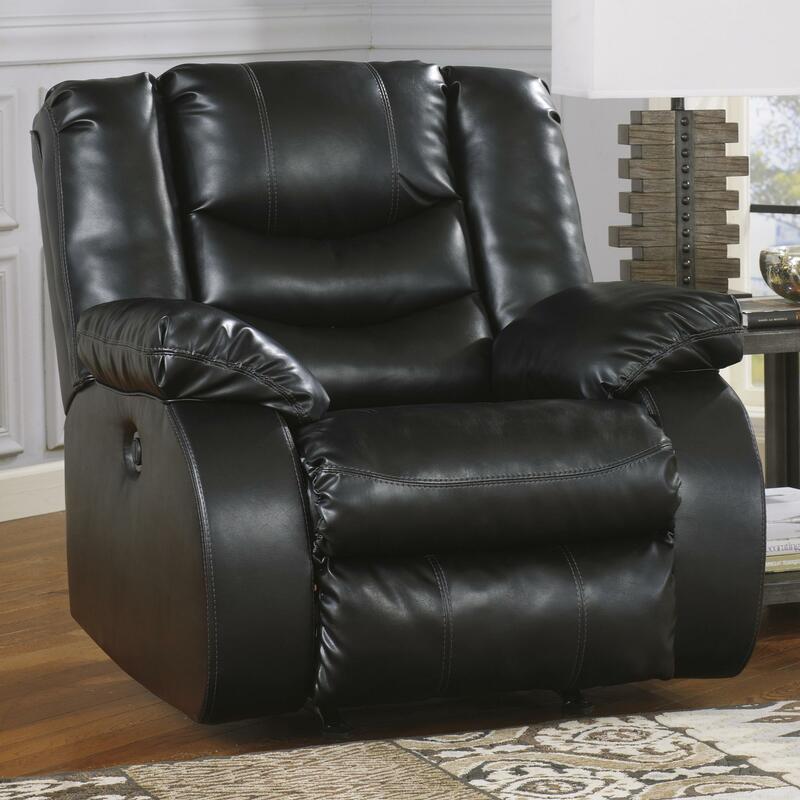 Create the ultimate at-home relaxation experience with this rocker recliner. Plush pillow arms and a stitched and divided seat back establish amazing comfort and support while you sit down to read a book or watch a movie. The fully padded chaise ensures that you experience the luxurious comfort from head to toe as you use the reclining and rocker functions to lean back for a quick power nap. 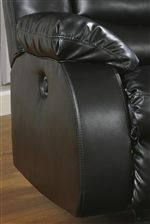 This rocker recliner is the perfect way to wind down from a hard day. The Linebacker DuraBlend - Black Contemporary Rocker Recliner with Pillow Arms by Benchcraft at Michael's Furniture Warehouse in the San Fernando & Los Angeles area. Product availability may vary. Contact us for the most current availability on this product. Fabric Content Collection features DuraBlend® bonded leather upholstery in the seating areas with Polyurethane everywhere else. 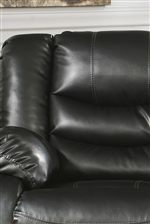 DuraBlend® is composed of 17% leather, 26% poly cotton, and 57% polyurethane. Fabric Options Collection comes only as shown in an a DuraBlend® fabric. Frame Construction Frames have been tested to GSA government standards. Corners are glued, blocked and stapled.All metal construction to the floor for strength and durability. 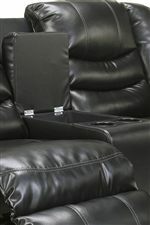 Complete your entertainment or lounge area with the contemporary comfort and style of the Linebacker DuraBlend series. With a rocker recliner, double reclining loveseat with console, and a reclining sofa, this collection is full of options that will make you never want to leave your padded bucket seat. Plush pillow arms are featured on each piece, with stitched and divided seat back cushions designed to give you extra support with a touch of style. The fully padded chaise allows you to enjoy the recline functions with head-to-toe comfort, making it easy to kick back for a quick nap. Created with DuraBlend® fabric, each piece features extra durability to give you long lasting, quality furniture. For added convenience, the double reclining loveseats feature a center console with storage and two cup holders, bringing the movie theater experience home to you. With style and features fit for any home, the ultra comfortable Linebacker Durablend series is full of motion seating options for you to create your perfect lounge or entertainment room. The Linebacker DuraBlend - Black collection is a great option if you are looking for Contemporary furniture in the San Fernando & Los Angeles area. Browse other items in the Linebacker DuraBlend - Black collection from Michael's Furniture Warehouse in the San Fernando & Los Angeles area.